It's been a hot minute since I last gave a LUSH Cosmetics review [totally tried to make you guys forget about my addiction], but let it be known that the obsession is still real. I'm still experimenting with various LUSH products ((one payday at a time)) that I'm super excited to tell you about in the near future, so without further ado, I'd like to introduce my holy grail: Dream Cream + Sympathy for the Skin hand & body lotion. Dream Cream [self preserving] // hand & body lotion: "Dream Cream contains every ingredient nature makes for soothing sore skin! One of our proudest achievements, we love this lotion because it makes people happy. 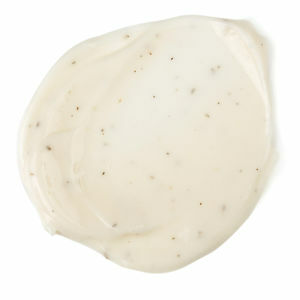 The calming blend of oat milk, lavender and chamomile goes to work soothing sensitive skin. Olive oil and cocoa butter are incredibly effective for dry or chapped skin, and are especially gentle for even the most sensitive skin.. Plus, this formula has been expertly rebalanced, so there’s no need for us to add any synthetic preservatives– it’s completely self-preserving! ", via LushUSA.com. My review: Yassssss. So much of it! I originally took two samples of Dream Cream home the first time I stepped foot in LUSH [one original + one self-preserving] because I had heard such great things about it working miracles on eczema and troubled skin. I had awful eczema as a child and started to see my dermatologist about it more than I'd even see my own reflection in the mirror. Luckily I grew out of this stage, but when the eczema left for good, it unfortunately left me with dry skin. I can't even get out of the shower without moisturizing unless I'm down to feel like a cactus the rest of the day. Okay maybe I'm exaggerating - but dry patches and little spots of eczema still come and go. What brought me to LUSH that day was because I had an episode of itchy, red, and dry patches under my eyes - which turned out to be an allergic reaction to my concealer (phew!). But what saved my life, healed my yuckiness, and completely killed that urge to itch, were my two little samples. 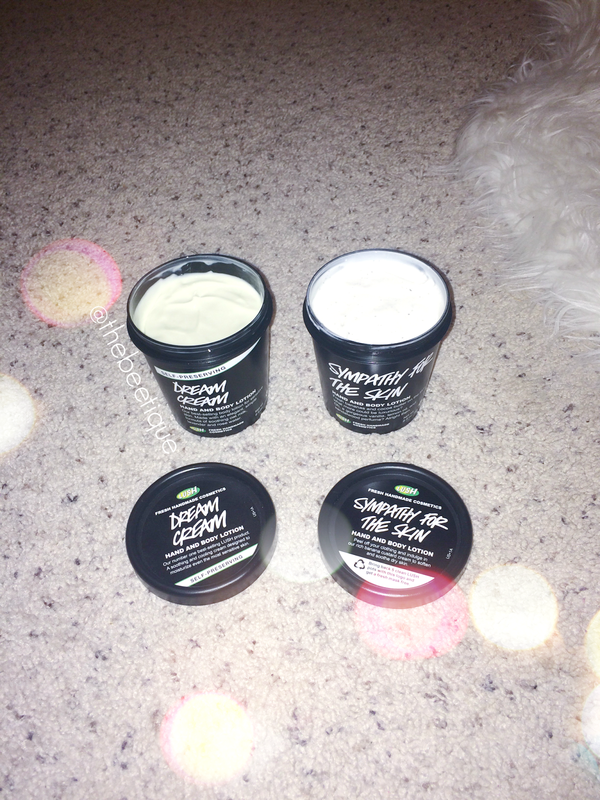 Dream Cream in both the original and self-preserving formulas are pretty thick and heavy lotions, so the two samples lasted me awhile. Not to mention it cured a sudden episode of heat rash hives during allergy season, too - when I decided it was time to buy a full sized tub. I started using Dream Cream daily and felt like the softest human alive. After making a dent in my brand new pot, I then realized lathering up in Dream Cream every night was kinda silly during the less drier months - which brings me to my love for Sympathy for the Skin. Now, I use Dream Cream as needed: After a day in the sun, shaving, or just when I could use that extra moisture. Sympathy for the Skin // hand & body lotion: "Creamy, banana custard body lotion for soft skin. Sympathy for the Skin is probably the only banana body lotion in the universe, and almost definitely the only one with real, organic mashed bananas in it. We use real bananas to moisturize and make skin softer and more flexible, even if they're a bit of a menace to mash by hand. We think you’re worth it. Incredibly soothing for dry or chapped skin, we blend in vanilla pods and vanilla extract to combat redness, lemon oil to brighten, and sandalwood to tone. Smooth our nutritious cream all over your body and go absolutely bananas." via LushUSA.com. My review: Even more yasssss! I was looking for something that would be less heavier than Dream Cream, and Sympathy for the Skin is exactly that. Sympathy for the Skin has now become my daily moisturizer and a staple in my post-shower routine. 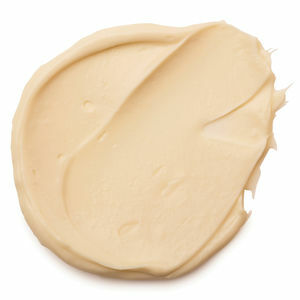 It absorbs so well without feeling like you need to "dry off" before putting clothes on, which Dream Cream tends to do. It has more of a lotion consistency than heavy cream, yet still will make you feel like the most moisturized human. A little goes a long way, and I'm completely hooked. The best part? Sympathy for the Skin has the most incredible scent - a cross between cocoa, vanilla and sweet banana. From the black tub, the smell is faint, but lingers throughout the day (in a wonderful way, I promise!). Don't be intimidated by the tiny brown specks of real bananas seen above, as the potassium and vitamin A in banana pulp have been a skin-softening secret for centuries. I highly recommend Sympathy for the Skin for everyday use while always having Dream Cream handy to use as needed. Both are a staple in my beauty routine, and I couldn't be happier to have taken LUSH Cosmetics's advice and splurged on both. See more LUSH favorites here! 4 comments on "LUSH » Dream Cream + Sympathy for the Skin"
Among Caucasians it is well known for the blurring Cindy Crawford Wrinkle Cream and expulsion of age or liver spots and comparable flaws and stains. Anyway prevalent skin creams contain numerous synthetic see this site concoctions and hard substances that are not beneficial for the skin and can disturb it or cause dryness.